Living large in small spaces: How can I maximize my space? I love every (coveted) square foot of the North End condo I share with my family. We have everything we need right outside our door and we've traded extra space for that convenience. We have learned how to make good use of the vertical space and nooks & crannies in our home. We have also worked hard to bring furniture into our space that has a dual purpose or can be folded and put away when not in use. Living small is a popular fad right now, but living in under 1000 sq. ft. is not quite so romantic when you get out of bed and trip over an ironing board (more on this later). These are a few of my tried and true tips (and some aspirational #homegoals) that we've used to maximize the space and functionality of our own (881 sq. ft.) space. Once upon a time, I owned a beautiful table with spindle legs and seating for 8. It took up our entire kitchen -- yet we continued to eat the majority of our meals at our breakfast bar and coffee table. 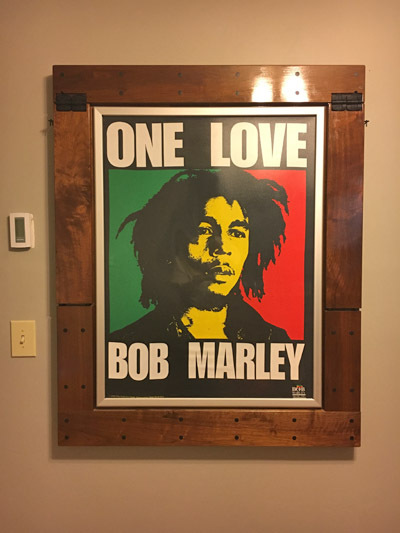 My husband had no love for this table, but I had purchased it for my first North End apartment -- painstakingly carried it up 4 flights of stairs -- and back down again when we moved into our condo. 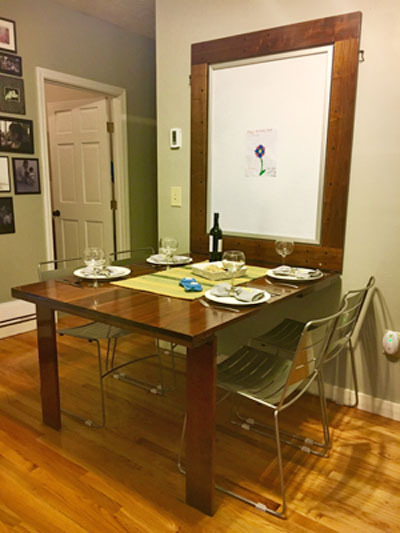 A couple years later when we learned our family was expanding, I listed my prized table on Craigslist and sold it to a fellow North End resident who (true story) lived in the apartment adjacent to my original (4th floor walk-up) apartment. "Dad, I have a small project for you." "No, I don't have building plans, but I do have a photo from the internet." "Yes, I am aware that there is a severe slant in our kitchen floor and that you live in Michigan. Thank you and good luck." Our table is a great place to gather when needed and sits on our wall as a beautiful piece of art when not in use. Take a minute to analyze where you eat your meals in your home and your appetite (pun intended) for unfolding a table at your hangriest of moments. 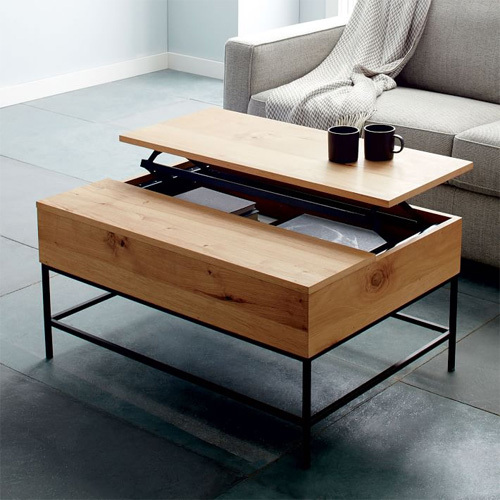 Perhaps a converted coffee table works well for your space? 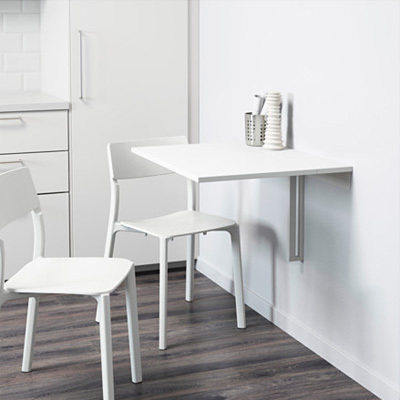 Affordable and space-saving dining for 2? 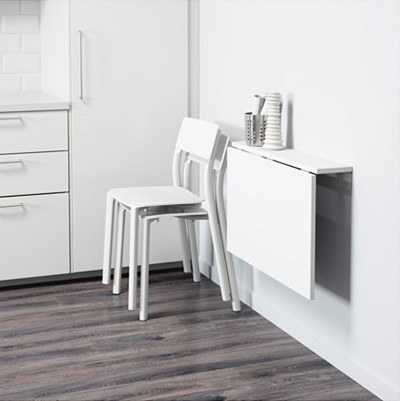 Hot tip: Invest in stackable or folding chairs to save even more space. Whether you live in 200 sq. ft. (I speak from past experience -- location, location, location!) or 2000 sq. ft., I believe under bed storage is one of the easiest places to find extra space and storage. 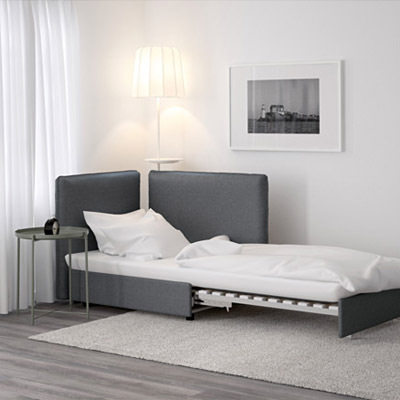 You can utilize bed risers or a built-in drawer system depending on your budget and storage needs. 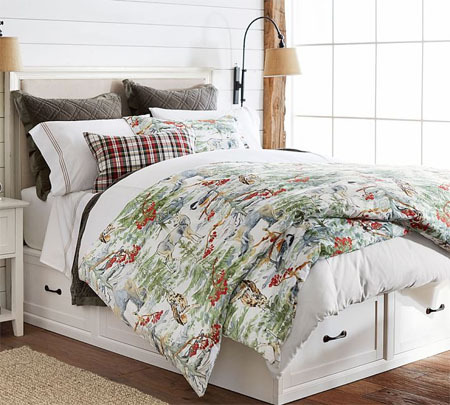 We own a Stratton Storage Platform bed from Pottery Barn like the one below. We were seeking a replacement for a large dresser, but didn't want to compromise aesthetics for function. We compared a lot of beds before we made our purchase and we chose this bed because it has large drawers on three sides (so much storage!). 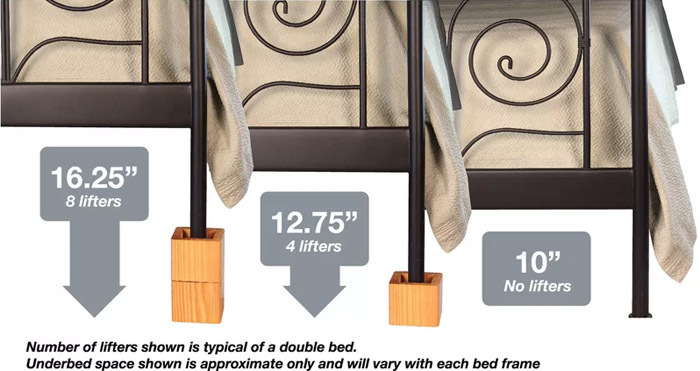 When looking at bed risers, there are so many options to choose from. Whichever option you choose, don't compromised on quality. No one needs to be awoken in the middle of the night because their bed risers fail (yes, again, I speak from experience). Admittedly, I haven't yet purchased a folding chair bed, but it's on my to-do list right after, "dispose of over-sized living room chair." Sometimes, owning a small home feels like playing real life Tetris. Sleeper sofas are fantastic, but often won't fit in small spaces. 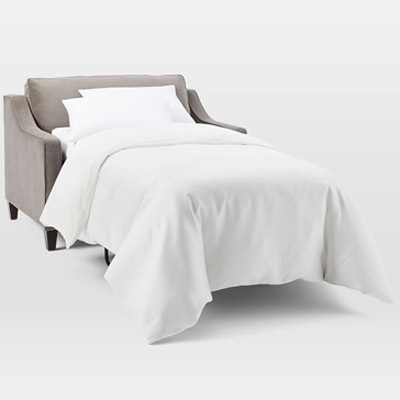 With any luck, these foldable chair beds won't require a crane delivery into your small space. If you're in Boston, the chances are pretty good that you live in a home with odd angles and rooms that aren't so square. This may leave you with alcoves and corners that are perfect for built-ins and other storage. Look around your space at the items that you need to store and get creative. 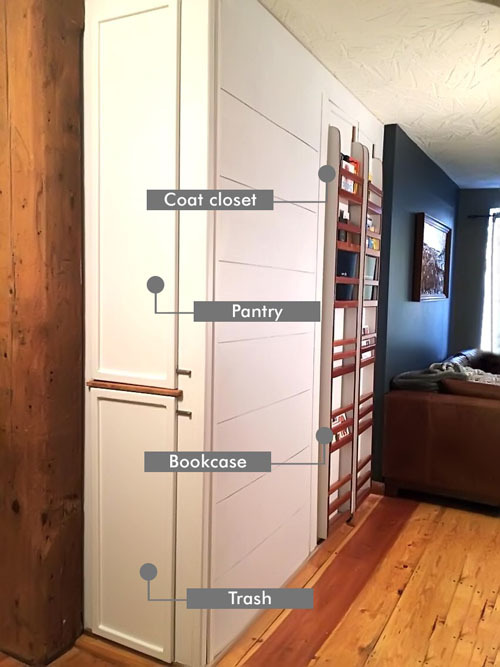 We transformed a living room alcove into a pantry/trash/coat closet with a bi-folding bookcase door. We also utilized the space at one end of our bedroom closet (you know, the space inside the closet that's unreachable and clothes go to die?) and turned it into a built-in armoire. When I say, "we" I really mean that we hired someone much more skilled with power tools than we are to bring to life my rough napkin sketches. Where there's not a space, make one. 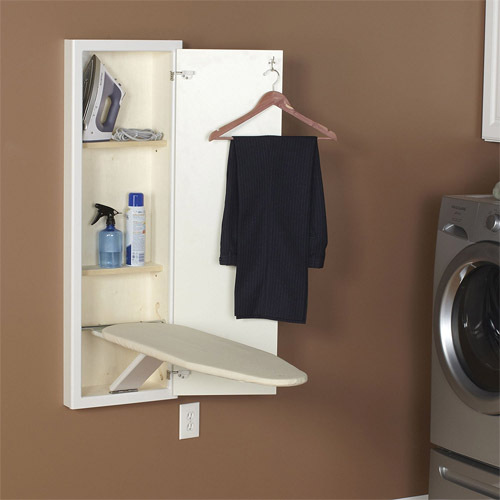 This ironing board cabinet has been life-changing for us. As mentioned above, the dream of a simpler life in a small place can be brought to a screeching halt the first time you go stumbling over your ironing board. Ironing boards are a necessary evil and we could not find a place to store ours that was convenient for everyday use, but out of the way the other 23.75 hrs. of the day. We cut a hole in our wall and installed this cabinet. Problem solved. When all else fails, get rid of your extra stuff. I can be practical to a fault, but when living small this personality trait can have its advantages. Donating various items within a city can be difficult if you don't own transportation. I've found Give Back Box to be an easy, convenient and free way to donate various items from our home that we no longer need. Fill a box (any box) with household items, request and print a pre-paid mailing label, and schedule your box for pick-up. My husband knows that when I get a large box from Amazon, I consider it my duty to fill the box to the brim and ship it back out again. Nothing is off limits. If you've decided that it's time to invest in more space, I can help with that too. Let's talk. You can reach me here.